The App Store is pretty much overflowing with games that are trying to capitalize on your nostalgia. 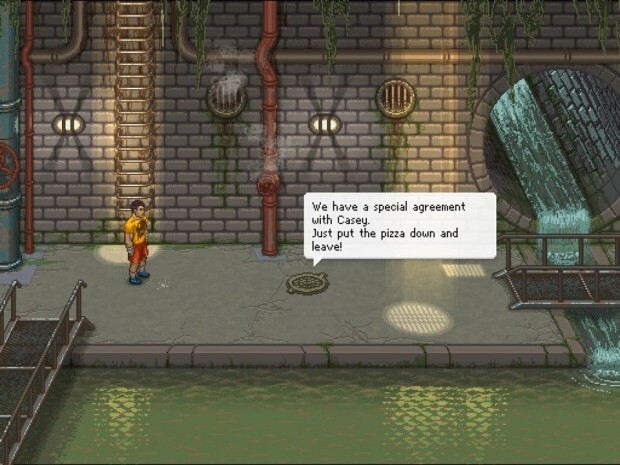 It seems like many developers hope that aping familiar art styles and systems will elevate their otherwise amateurish endeavors. There is nothing wrong with making a love letter to a series you enjoyed growing up, don’t get me wrong, but it’s becoming a tired gimmick. 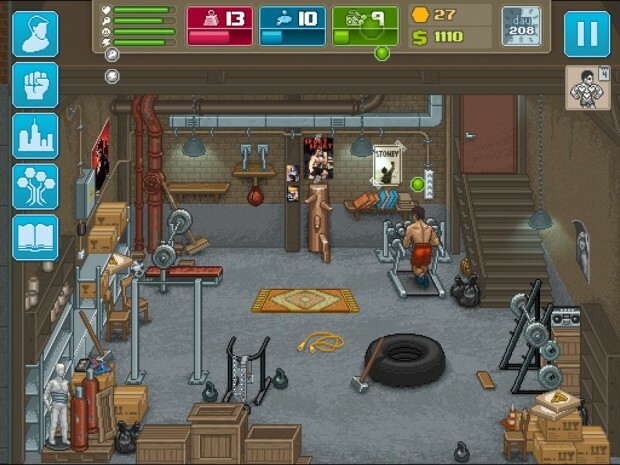 Then, a few cool cats from Russia follow the same principle of nostalgia, except like Ivan Drago from Rocky IV, it’s veins are coursing with steroids instead of blood, and you get a game so jam packed with references and tropes that you can’t help but smile. Until the grind kicks in that is. 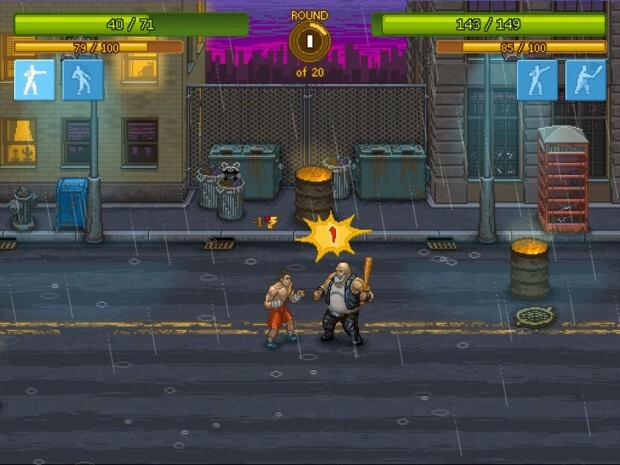 This is Punch Club ($4.99). Here’s the thing about Punch Club. It’s not just some retro inspired game. It’s not another Mario or Mega Man clone. It has very modern sim gameplay. But the story, and each screen, and most of the characters are just jam packed with references and memorable imagery. This is basically a sim of the 80’s fighter movie, so all the nostalgia is quite warranted. Melding classic fighting movie tropes with an air of mysticism centered around a powerful medallion, you play as a fighter whose father (also a fighter) was killed when he was a child. Soon after your twin brother has disappeared. Now you’re determined to become a great fighter yourself, and hopefully get to the bottom of your father’s murder. The only way this game could be any more 80’s is if the devs shipped you a headband and some legwarmers with every purchase. I won’t spoil too many of the references. It’s a lot more fun to find them on your own. But so you understand the breadth of the situation, you’ll see references to Rocky, Blood Sport, Cobra, The Teenage Mutant Ninja Turtles, Mortal Kombat, Street Fighter, Fight Club, Aliens, Speed freaking Racer, and more. Granted, it’s not all 80’s nostalgia. There is a fair bit of 90’s stuff in there as well, but it all fits the general theme and aesthetic, or lines up with the story. Lazy Bear Games has done a great job with this aspect. The pixel art isn’t just slap dash, or done because it’s cheaper/easier. Every screen is a masterpiece, lovingly detailed, even blown up on an iPad screen. I don’t have a lot of nostalgia for pixel art, but I love it as a style when it’s actually done artfully, as in this case. And despite putting over 10 hours into this game, I never once tired of the repetitive chip tune soundtrack. So you know it looks good and sounds good, but how does it play? Sometimes, it’s pretty magical. Other times, you’ll deal with ­MMO level grinds as you try to overcome that next difficulty hump. So like in any sim, you need to keep your fighter fed, well rested, and happy. But you also need to work to earn money. You do earn money from fights, but not much early on. So you’ll have to do a construction or pizza delivery job, which can take up a full third or half of your day and really saps your hunger and energy. But you also have to find time to train your strength, agility, and stamina stats, either at home or on the superior equipment at the gym. You’ll also need skill points to learn new moves and new passive upgrades. You only get skill points from fighting or sparring. Sparring or training at the gym costs money, and it’s a while before free alternatives pop up. There is a daily time cycle which determines when your fight opportunities come up, so you have to try to be fight ready on fight day. This means hopefully being at full health. Every time you take damage in a fight or while sparring, it takes time to heal, and going into a fight with low health will factor into your hit points for the fight. If you don’t want to spend a few of your precious hours each day walking around the city, you’ll have to take the bus, which also costs money. Oh, and walk around with too much money, and you’ll be mugged, and the muggers are very strong early game. But the thing that really makes this game hard? You lose some of your stats every single day. And the higher your stat is, the more you lose, based on multiples of 9. This can be so frustrating, and it really takes some time to figure out a good system for timing your training, work, sparring, etc. It is absolutely vital that you participate in every fight you can. I’ll tell you right now. Stats don’t necessarily win fights. Skills do. Sometimes you’ll have higher stats than your opponent and still lose. There is a factor of random chance at play in the fights. The fights, I should mention, are basically non-interactive. You just watch them happen. You can change which skills your fighter takes into the fight each round, but that’s the extent of it. There definitely seems to be some rock paper scissors going on with the stats. My super high strength fighter dominated everyone unless they had ludicrously high agility. Different skills have various buffs and de-buffs, and take different levels of energy. You have to find a synergistic set of moves. Even if you lose your fight, you’ll still get a couple skill points. Make sure you spar whenever you can. It takes time to save up points, but it really helps in the long run. Especially because there are skills that keep your stats from lowering below a certain threshold, at level 4, 8, and 13. Basically, you should try to get all your stats to a baseline of 4, and then just train your skills, not worrying about training your stats, because you’ll waste ages of time trying to keep your stats up. Once you reach a certain skill level, you can choose one stat to focus in with a unique corresponding ability tree. Then, when you have enough points to raise your main stat to 8 or 13, go train like crazy for a few days (and maybe buy some “magic potion” at the fitness shop). You can use the temporary stat boosts from the potion to reach that new skill floor. What I don’t like about the game is that there is no way to re-spec your skills. And you’ll learn as the game goes on which skills were worth buying and which ones you completely regret wasting hard earned points on. It’s also possible to make certain skills un-usable after picking up certain traits. This is pretty true to life, you can’t just unlearn all your knowledge and skills and pretend you learned something else all along. But it’s frustrating, and this is not a game I would ever want to play all over again with that new knowledge. There’s just too much tedium at times and not a whole lot of replayability. Anyway, I’m harping on a lot about specifics, this isn’t a guide, but a review! True to real life, it’s a real struggle to get ahead and balance your passion and interest with your day to day survival needs. And like real life, things come in cycles. Sometimes, things will go really well, you’ll be on top of the world, easily winning your fights and keeping within your budget. But then you’ll hit another grind. It’s very hard to stay motivated through some of these grinds, but the payoff when you reach another easy phase of the game, or make real progress in the story, is just great. Eventually, way down the line, you do make your big break. You can earn your professional fighter license, get a sponsor and access to a daily income, full gym, and some daily food. Things really change up at this point, as you also have a level of fame to maintain by shooting movies, throwing parties, and doing advertisements. But then the hardest grind of the game picks up as you have to work your way through the final tournament, where your opponents start to have ludicrous stats. When you reach a new stage of the story, and the formula is really shaken up, this game becomes really delightful. But the grind is just so brutal at times. Also, you’ll have multiple quest lines, and when you advance the story to a certain stage, those quest lines just disappear uncompleted. I wish the devs would have included that classic *Wink wink nudge nudge everything is about to change* that we so often see in gaming. I also wish the game wasn’t so brutal with sapping your skills at the end of each day. Some kind of system where you need to train every other day, or maybe train on upgraded equipment or something to see progress. 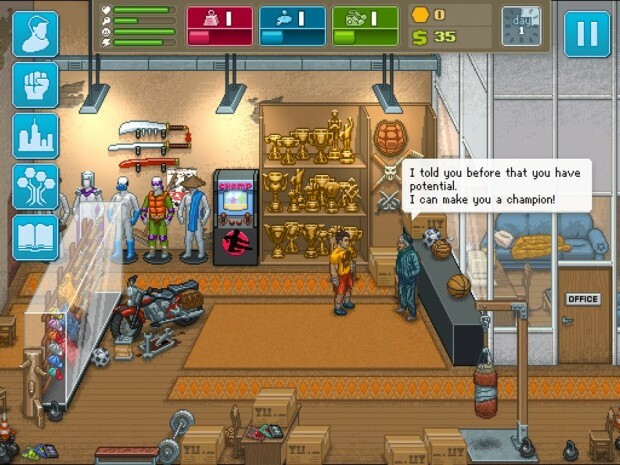 At the end of the day, Punch Club is pretty awesome, and it uses nostalgia creatively. If you’re into that sort of thing, and if you can deal with the grind, you should definitely check it out. Your opinion of the game will fluctuate wildly depending on how many hours you’ve put in. At least, mine did. Despite the myriad opportunities for some IAP boosts to make things easier, this is a premium game with no IAP at all, and it’s definitely a labor of love. Make sure to swap strategies in our forums, because this game is super complex. The developer and publisher have been talking about rebalancing the game in future updates too, so keep an eye out if you’re still on the fence.